The World's Only Magazine Dedicated To ALL Things Barbecue! The April cover features a newborn who was literally born to barbecue. 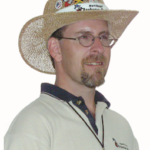 As you can see from his snazzy attire he is already an avid fan of the National Barbecue News and enjoys hearing about all of the cool things happening in the barbecue world. While working on the cover photo I asked myself was I born to Que? After a quick couple of seconds, I simply smiled really big as there is no doubt in my mind that I was born to Que! The answer to this question is simple for me to answer because I love everything about Que and to be honest…and hopefully not arrogant…I am good at it. The combination of those two things tells me that I was indeed born to Que! My barbecue days started back in middle and high school when I would follow my dad and his fishing buddy Dr. Don “Doc” Gillis around as they would cook on the Memphis In May circuit of competitions. The times that got me hooked on Que the most was their practice samples and how a little more of this or little more of that could make a huge difference in the end product. Once I got a bit older and started cooking on my own I realized how much fun it was to create something different and good at the same time. 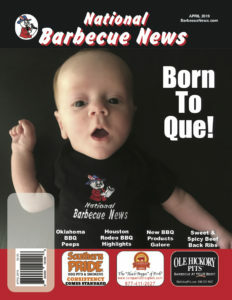 Now back to the little pitmaster on the cover and how I know he was born to Que. His Papaw was actually wide open at a BBQ competition when he was born. Of course he was on the phone constantly with updates from the hospital and relied on his team to get everything got done correctly. Now that the little fellow is growing up he is hearing all about all the smokin’ adventures of his Papaw and that will no doubt set him on a path to be born to Que! The April 2019 cover boy is none other than grandson to our awesome contributor Vic Clevenger. Caspian will no doubt have a huge head start on his cooking career just because of his mentor being so connected to the barbecue world. We are predicting great things for this little guy who is already labeled…Born To Que! Latest BBQ News Magazine Here!